The story of the sanctuary is connected to the history of Blessed Bartolo Longo, founder, and finder of the image of the Madonna, which has become the symbol of the cult and for its renowned miraculous. The sanctuary was built thanks to the offerings made by devotees from all over the world. Construction began on May 8, 1876. The church had several phases of construction, because the fame spread, and with it the visit of thousands of pilgrims. So the first nave was expanded to reach today the three aisles. The pilgrimage also involved three popes: Pope John Paul II October 21, 1979 and October 7, 2003, Pope Ratzienger 19 October 2008 and the current pope, Francis March 21, 2015. The shrine attracts more than four million members, making it one of the most important goals of religious tourism. 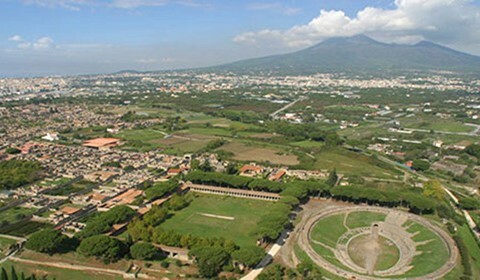 In particular, on 8 May and the first Sunday in October, many pilgrims reach the city of Pompeii, to attend the so-called Supplication to Our Lady of Pompeii, a prayer written by Blessed Bartolo Longo. Bartolo Longo decided to buy a painting of Our Lady of the Rosary and take him to Pompeii with him. He had already identified the painting that was good for his intention, but he was dissuaded by his confessor, met by chance, that told him where to get the painting: from a monastery to which he had entrusted to his time playing this. But when Bartolo Longo saw this painting was appalled: a framework was badly deteriorated and charmless. But following the advice he wanted to take it and bring it with him to Pompeii, where, to his colleagues, he did the same effect. The painting was then restored and so could first be displayed in a temporary altar, and then went to find its destination in this specially built sanctuary. In short its fame grew, and the image was adorned with beautiful precious stones offered by beneficiaries. The last restoration was done in the 60s of the last century, according to scientific criteria, and under the canvas were discovered the original colors of a canvas painted in the seventeenth century. The precious stones were removed to prevent holes or damage to the original painting. An extraordinary travel back to the past to discover a buried story, a forgotten tragedy, commemorating everything happened in that last day of Pompeii.